One beautiful spring day, he left his sofa and his video games to make a trip into the wild. Equipped with only a sandwich consisting of bread, gummy bears and peanuts, he started walking towards the outskirts of civilization. Owl of the Howl is the story about what happened after the outbreak of darkness. 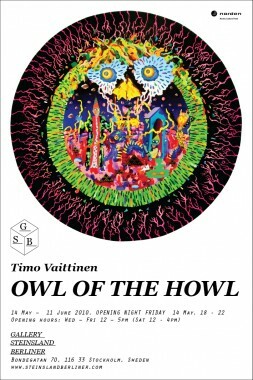 The exhibition Owl of the Howl is a reflection of the mind of Finnish artist Timo Vaittinen. Brief moments of real memories and impressions from the artist’s past are mixed with fragments of fictional events and dreams. They take the forms of a variety of symbolic objects and figures in bright colors. When these are mixed, new narratives and realities take form. The intense aesthetics of Timo Vaittinen reflect not only the artist himself, but also the generation he grew up in and around. His imagery is rooted in the popular culture that so many of us, in one way or another, have been a part of. With Owl of the Howl he evokes memories and emotions that leave no one untouched. Timo Vaittinen (b.1976) is one of our neighbouring country’s most interesting upcoming artists. Born in Porvoo in Finland, he now lives and works in Helsinki and Berlin. Vaittinen was educated at the Academy of Fine Arts, Helsinki. He has previously been shown in various parts of Europe, Asia and USA. This is his first solo exhibition at GSB.